FILE - India is looking to extend the reach of its lucrative generic drug industry into Africa, where the need for low-cost medications is great. Developing countries in Africa are battling a host of deadly infectious diseases, from diarrheal conditions to malaria to HIV, and some think India may have a way to help. But complications arise. India's prime minister, Narendra Modi, met recently with the heads of state of more than 50 African countries to discuss ways India — which has become the world's leader in the manufacture and export of generic drugs — can improve the continent's health infrastructure. Such drugs cost a small fraction of the originals, and exports have reaped $15 billion for the Indian economy, according to some estimates. But inspectors have identified factories that produce substandard drugs that are dangerous, either because they contain toxic ingredients or because they simply do not work. Fake malaria drugs already have made their way to Africa, and some worry that more copycat drugs could be on the way. "India seems to segment its markets,” said health economist Roger Bate with the American Enterprise Institute, a Washington-based research organization. “ ... on average it sends the better quality medications to countries like the United States. And the medicines that do not pass quality control, it sends to poorer nations, particularly those in Africa." 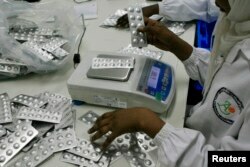 FILE - Employees inspect medication tablets in Africa. Gaurvika Nayyar, a global health consultant, backs the contention that poorly made and counterfeit drugs are being exported to poorer countries. She says she has visited some of the sham factories, but she stresses that knowing about the problem and taking action are two different things. "You can see there [are] children in the market buying the counterfeit drugs, taking [them] and dying,” Nayyar said. “And that is actually what inspired me to work on the problem, but … how do you translate that into policy and action so we can actually fix it? And that is where I think this entire engine is stuck." Samples of drugs that have made it to market can be tested for purity and effectiveness, Nayyar says, but tracing bad drugs back to the source can be extremely difficult. And, while most generics do what they are supposed to do, health officials in poorer nations face a dilemma, according to Bate. "You know the immediate response of anyone taking the drugs is horror,” he said. “You know, surely, you should just boycott the product. The reality is that it is very difficult to do that because you end up with significant shortages." For their part, experts say, countries in Africa are interested in limiting the potential for sham medications by manufacturing their own generic drugs, both as a way to boost their economies and get life-saving medications to their people.